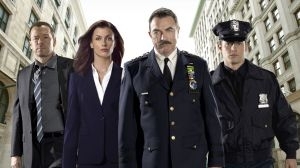 The multi-generational Reagan family and their dedication to the New York City Police Department. Although being a tight-knit family you may find that the Reagan's have very different ideas of how to gain justice but, they have one thing in common they'll stop at nothing to see justice served because, their occupation is more than just a job it's the family business. DNA evidence in a murder case leads Danny and Baez to identical twins with identical alibis. Also, Frank learns Nicky is interviewing for a job at the Justice Coalition, which he rarely sees eye-to-eye with, and Jamie visits Eddie’s father, Armin, in prison. February 4th 2014 Genre rating added by Kirios. February 4th 2014 Stats edited by Kirios. February 1st 2014 Rated by Kirios. April 8th 2012 Rated by Shanneke39. October 23rd 2010 Genre rating added by Administrator. October 23rd 2010 Genre added by Administrator.